Australian Open 2018: Can Gilles Simon roll back the years in Melbourne? It was the winter of 2008. Roger Federer, in his attempt to dominate world tennis once again, participated in the Tennis Masters Cup in China so as to truncate the gap between him and the then World Number 1, Rafael Nadal. However, the Swiss maestro's effort to regain the top spot hit a wall in his very first game of the tournament. This wall was constructed by a 24-year-old from France, who had entered the competition as a substitute, in place of a fatigued Nadal. With a display of clinical and cautious tennis, Gilles Simon attained his second career win over Federer in the match, to the astonishment of the assembled spectators in Shanghai. The man, who was the lowest ranked player in China, had a head-to-head record of 2-0 against the greatest player to have played the game. A lot has changed over the past decade for Simon. The same head-to-head record is now at 2-6 and Simon's side of the hyphen has remained unchanged through the years. The man has toiled extremely hard to rise through the ranks since then but somehow, has found himself on the wrong side of the end-result more often than not. 2017 was an extremely testing year for the 33-year-old. He was toppled to Number 84 in the ATP singles ranking and it seemed like his once-glowing career would go down a dark and diminished road then. However, the right-hander is nothing if not a fighter. 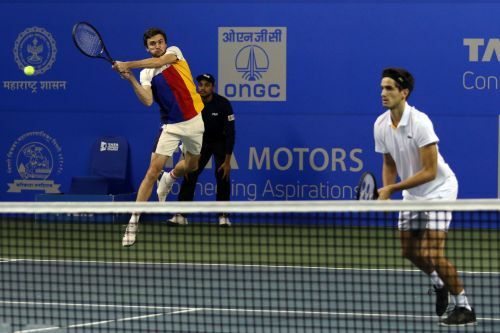 He started the 2018 season with a flourish: the Frenchman elevated the level of his game, participated in his maiden tournament in India, reached two finals in the same, and ended up winning the singles title. He turned his fortunes around with some exceptional tennis throughout the week. The man reached the first doubles final of his career in the tournament. He could not cross the last hurdle there, but his mere presence in the final four was a victory in itself. Singles players always talk about the benefit of playing doubles from time to time. However, does it hamper their solo game sometimes? "Sometimes it does have a negative impact on your confidence. I have been more successful in singles and when you lose week after week (in doubles), it really doesn't help. You really have to know why you decide to play doubles. For me, it was to improve," Simon said while speaking with Sportskeeda. "But I am a competitor, I want to win," he said. "That's where the stress comes in. Sometimes the effect is good, sometimes bad. 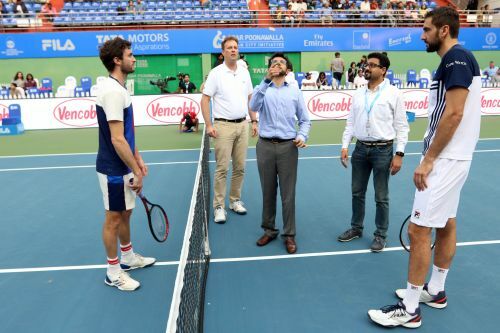 The first doubles game I played in Pune helped me. I felt great, especially on serve. However, I also have some memories where my singles game was perfect and then a disaster followed in the doubles, which ruined the next singles game for me." His fighting spirit and undeniable dedication won the hearts of the Pune crowd, and the audience got behind him in the final, almost as if he was one of their own. Talking about the immense support that he received from the Indian fans, he said, "I was really surprised (by the support I received). It feels good. I played a very good match on the centre court against Roberto Batista Agut, who was the defending champion. I played few very good shots in that game and after that, something happened during the week (that led the fans to get behind me). I felt like home here." Simon might've been surprised by the cheers he received, but it was pretty clear why the fans went all out in support of him in the latter stages of the game: he set up incredible victories against Batista Agut and Marin Cilic in two closely-contested games. The former was the defending champion of the tournament and the latter was its top seed. The fact that Simon, a blatant underdog, fought and triumphed against both, was not lost on the audience. The incredible winners that he produced against them from tight and testing angles conjured roars from the stands and his unreal court coverage created an instant impression on the audience. "I have nothing to lose (when I hit such shots). When you are ten meters behind the fence you just want to put the ball in somehow. The point is going to be over anyhow and I just go for it then. It's a great feeling when I can make it happen," he said, reflecting on the unreal winners that he produces from crunch positions. What he lacks in serve and power, he makes up in court coverage and precision. His shots, though less in power, are deep and clinical. The way he runs on the court is nothing short of exceptional, more so with his age. His frame is relatively smaller compared to the average tennis player. However, he does not believe that he should be flustered by the same. "It's not like I can grow in size now. It's just how it is. I have to deal with it and find solutions (against big players) on the court. I really don't think this is something I should focus on. (These players) will be dropping bombs on serve and will have relatively easy points that I won't have in each match. If I focus on that, it is going to be hard (for me) to win. I would like to focus on the part of the game where I'm better than them," he stated with conviction. 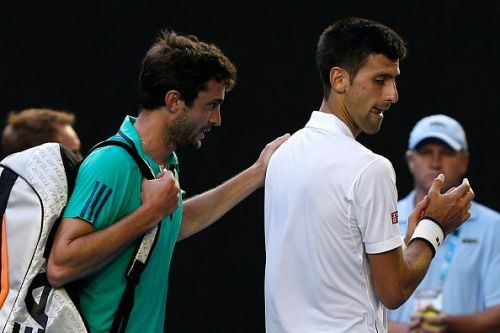 Almost a year ago, Novak Djokovic won the worst five-setter he has ever played on tour. This was at the Australian Open. He made as many as 100 unforced errors in the game but trodded to the next round anyway. His opponent in the game was Simon, who gave it his all, but still couldn't get past the line against the Serbian Number 1. That loss must've stung and crashing out of the competition like that must've been painful. However, the fight inside the Frenchman will not cease anytime soon. He is back Down Under and ready to compete at the biggest of stages, once again. He has jumped 32 places in the ATP rankings and will participate in the tournament as World Number 57. This time, he is coming off the back of a big title victory. Can he roll back the years to his days of glory, one last time?